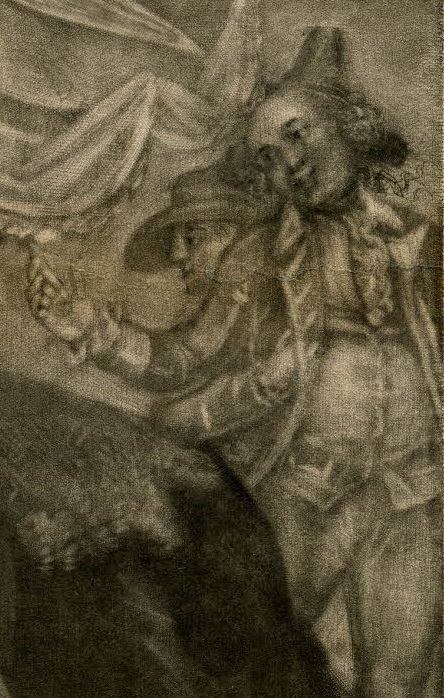 "The Agreeable Surprise," Robert Pollard, 1785, British Museum. Come tripping oe'r the fallow ground. And hugg'd her bonny Sailor. This print and the accompanying happy ending was brought to my attention by longtime reader Adam Hodges-LeClaire. Thank you! A pair of very well dressed women have just witnessed the wreck of a ship in a terrible storm, but Sall is relieved to see that her love has made it safely to shore. 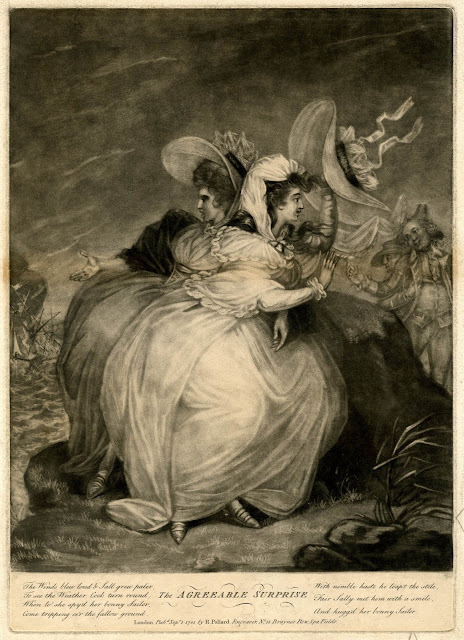 Given the often very lethal result of shipwrecks in the eighteenth century, this sort of print must have proved a comfort to women throughout Britain who feared for their husbands who might be gone for years at a time. The man in front wears a rather nice suit, but given the way his gaze is fixed on Sall, is certainly "her bonny Sailor." The way that both he and his love are dressed suggests that he is an officer of the wrecked ship, if not her captain. The term sailor is not exclusive to the common men, but a general term that refers to all of those who use the sea, including masters. It is worth noting that he wears the preferred hairstyle of mariners at the time: the bob wig. The common sailor behind him wears a round hat with cylindrical crown and wide, drooping brim.